Is there anything worse than having to back into a parking space on a busy street? You never know whether people will stop to let you in, how great a traffic jam you’ll cause, or whether the spot will be stolen before you get it. On top of all that, I had an additional worry while backing up the other day: Was I breaking the law? Spotting an empty meter, I pulled over to get a good angle to back up, as I normally would. But in doing so, I completely blocked a marked bicycle lane alongside the metered spaces. Within seconds, a cyclist came cruising down the lane, with no choice but to stop and let me back up. By the look on his face he clearly thought he had the right of way, which made me wonder: Was it actually illegal for me to be in his lane? With so many communities painting bicycle lanes on their streets, and cycling on the rise in general, it’s a good time to revisit some bike-related road rules. My gut told me I was wrong to have blocked the bike lane. “What I would say to the bike rider is, ‘I agree it’s an inconvenience, but you’re another vehicle on the road, and this guy’s legitimately trying to park. Too bad,’ ” said police instructor and lawyer John Sofis Scheft, whose consulting business, Law Enforcement Dimensions, is based in Arlington. Marked bicycle lanes visually remind motorists to leave a safe distance between their vehicles and cyclists. They can also serve as a refuge for cyclists on roads with faster-moving drivers. But as far as state law is concerned, marked bicycle lanes are still part of the road, which means that motorists can drive in them too, Scheft said. “It’s assumed that motorists will operate in them, but that they won’t obstruct bicyclists,” he said. It’s fine to wait in a bicycle lane to back up, to drive in a bike lane when passing a car that is waiting to go left, or to cross a bike lane when turning, Scheft said. Cyclists, in fact, often want motorists to move into a bike lane in advance of making a right turn. The maneuver reduces the chance of a cyclist getting cut off by a motorist who turns in front of them at the last minute without signaling, a “right hook” in bicycling parlance. 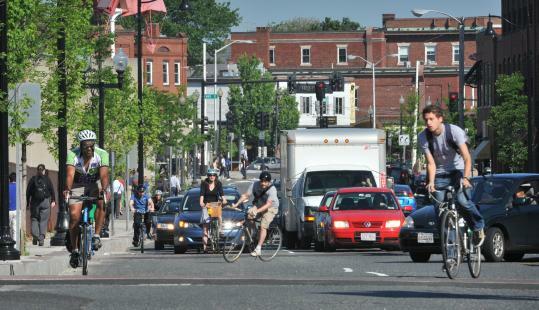 “That’s important because people using their signals is pretty uncommon in Boston,” said Pete Stidman, executive director of the Boston Cyclists Union, one of Greater Boston’s fastest growing cycling advocacy groups. Still, you shouldn’t drive in a bicycle lane longer than is necessary. Since your car is wider than a bike lane, you’d be straddling lanes. “If a vehicle was driving in a bike lane and unfairly blocking bicyclists, an officer could charge them with a marked lanes violation, a $100 fine,” Scheft said. If you were endangering a cyclist by driving in the bicycle lane, you could also be cited with illegally overtaking a vehicle. A total of 616 bicyclists were killed in crashes with motor vehicles nationwide in 2010, the most recent year available, according to the Insurance Institute for Highway Safety, which advocates for helmet use (Massachusetts law requires only riders 16 and under to wear them). One last point: Even when a marked bike lane exists on a roadway, a cyclist can choose to ride in a travel lane, like any other vehicle on the road. Bike lanes aren’t the only pavement markings for cyclists. Some communities also are painting shared-road symbols on streets, typically the outline of a bicycle under two forward-pointing arrows. But unlike marked bike lanes, such symbols don’t tell motorists how much clearance they’re supposed to leave for cyclists. “The nice thing to do, and the safe thing to do, is to give bicyclists at least a 3- to 4-foot clearance from the edge of their handlebars to the car, whether they’re in a bike lane or not,” Stidman said. What if you have to cross over a double-yellow center line to give a cyclist enough space. Is that legal? Our state statutes don’t specifically answer that question, either. But Scheft said they “clearly imply” that you can cross, so long as the opposite road is clear. In other words, everyone has to compromise. Bike citations are rare, in part, because of two flaws in the state’s ticketing system, though one will soon be corrected. Currently, for an officer to ticket a cyclist, a standard motor vehicle citation has to be used with the handwritten words “bicycle infraction,” or something to that effect. But by August, police departments will be able to order citation books that have specific bicycle notations on them, said Sara Lavoie, spokeswoman for the Registry. The second problem, which I wrote about last August, still remains: The way state law is worded, bicyclists can’t be forced to pay the tickets they receive. But with clearer tickets, it will at least be easier for police to hand them out. See him on Facebook at “Who Taught You to Drive?” and ­follow him on Twitter @whotaughtU2driv.